Mokhlesian, M., Zegordi, S., Kamal Abadi, I., Albadvi, A. (2015). Pricing decisions in a two-echelon decentralized supply chain using bi-level programming approach. Journal of Industrial and Systems Engineering, 8(1), 106-124. Maryam Mokhlesian; Seyed Hessameddin Zegordi; Isa Nakhai Kamal Abadi; Amir Albadvi. "Pricing decisions in a two-echelon decentralized supply chain using bi-level programming approach". 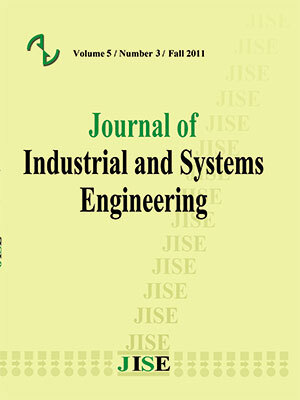 Journal of Industrial and Systems Engineering, 8, 1, 2015, 106-124. Mokhlesian, M., Zegordi, S., Kamal Abadi, I., Albadvi, A. (2015). 'Pricing decisions in a two-echelon decentralized supply chain using bi-level programming approach', Journal of Industrial and Systems Engineering, 8(1), pp. 106-124. Mokhlesian, M., Zegordi, S., Kamal Abadi, I., Albadvi, A. Pricing decisions in a two-echelon decentralized supply chain using bi-level programming approach. Journal of Industrial and Systems Engineering, 2015; 8(1): 106-124. Pricing is one of the major aspects of decision making in supply chain. In the previous works mostly a centralized environment is considered indicating the retailers cannot independently apply their decisions on the pricing strategy. Although in a two-echelon decentralized environment it may be possible that supply chain contributors have encountered with different market power situations which provide that some of them try to impose their interests in pricing and/or volume of the products. In such situations the leader-follower Stackelberg game or more specifically bi-level programming seems to be the best approach to overcome the problem. Furthermore, in this study we consider the impacts of disruption risk caused by foreign exchange uncertainty on pricing decisions in a multi-product two-echelon supply chain. Also it is assumed that the market is partitioned to domestic and international retailers with segmented market for each retailer. The purpose of this paper is to introduce decisions policy on the pricing such that the utility of both manufacturer and retailers is met. Since the proposed bi-level model is NP-hard, a simulated annealing method combining with Tabu search is proposed to solve the model. A numerical example is presented to investigate the effect of foreign exchange variation on the decision variables through different scenarios. The results from numerical example indicate that the international retailers are indifferent to the manufacture undergoes changes where the domestic retailers react to changes, dramatically. setting. European Journal of Operational Research, 227(3), 552-557.
problems in supply chains. Journal of Global Optimization, 51, 245-254.
chain networks. European Journal of Operational Research, 182, 164–173. supply chain management. International Journal of Production Economics, 133, 86–94. chain with consideration of transportation disruption. Computers & Industrial Engineering, 64, 552–561. programming problem. Knowledge-Based Systems, 23, 239–242. when production costs are disrupted. Economic Modelling, 30, 521–538. programming problems. Applied Mathematics Letters, 20, 880–884. supply chain with supply disruption. Int. J. Production Economics, 124, 137–150. planning of global supply chains in the process industry. Omega, 41, 369–382. Liu, Z., &Nagurney, A. (2011). Supply chain outsourcing under exchange rate risk and competition. operations research problems. Omega, 22(1), 41-56.
linear programming problem. Computers and Mathematics with Applications, 58, 678-685.
under risk and uncertainty. Transportation Research Part E, 41, 585–612. Theory and Applications, 163(3), 949-956. Sahni, S. (1974). Computationally related problems. SIAM Journal on Computing, 3, 262–279. Saygılı, H.,& Saygılı, M.(2011).Structural changes in exports of an emerging economy: Case of Turkey. Structural Change and Economic Dynamics, 22, 342– 360. Risk pooling, risk diversification, and supply chain disruptions.Omega, 52, 201-212. Journal of Production Economics, 116, 12–27. for managing supply chain network risk. Int. J. Production Economics, 119, 247–258. programming problem. Applied Mathematics and Mechanics (English Edition), 28(12), 1605–1612. and Evolutionary Computation, 8, 26–32. bilevel programming problem. European Journal of Operational Research, 88, 563-571.